I awoke with a start yesterday morning as I heard a very loud, deep 'thunk' and I immediately suspected that our rudder had hit a submerged rock. The wind had veered to the north, which was odd because the bay runs east and west with steep sides on both banks and we had swung too close to the southern shore. Unfortunately, the water had become a very murky brown which I presumed indicated a heavy rain ashore and Andy from the catamaran Savannah said that those are the worst conditions for sharks - unable to see well their favorite prey, they might snap at anything. Regardless, I donned my mask and made a quick inspection of the rudder and skeg which I found to be OK. I wasn't worried about Rutea's bolt-on cast iron keel. We hoisted a full main as we departed from Daniel's Bay only to find 26-28 knots of easterly trade winds and the matching seas. 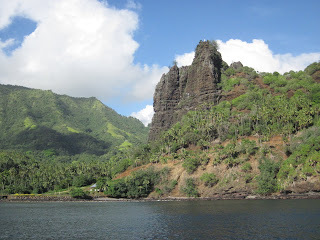 Since we were embarking on a clockwise circumnavigation of Nuku Hiva, we'd soon be in the lee of the island so it didn't concern me too much plus it gave Corie a good upper body workout on the helm. Sure enough, just a couple of miles further and we had rounded Cap (sic) Motumano, the winds calmed and the seas flattened out enough for me to make an organized breakfast. However, I knew that once we rounded Pointe Hipahaapapa on the northwest corner of the island we'd find the same boisterous trades that we had on the southern side. This time I tucked a single reef into the main and with the engine still going, we proceeded to bash into 12 miles of uncomfortableness. It took four hours to cover the distance to Baie D'Hatiheu and I was tempted to pull into any one of the bays we passed along the way. The track on our chartplotter looks like a saw blade. The bay immediately east of D'Hatiheu is called Anaho and is know as the calmest bay in the Marquesas but we'd heard and read such good things about D'Hatiheu that we decided to at least check it out. The sides of the bay are almost parallel and probably a half-mile apart. After dropping the anchor exactly where the guide book says (Ruthie likes it that way), we launched the dink and headed for the small quay. The swell action at the quay was not to be taken lightly and it took us several attempts to get everyone on shore and get the combination of the small anchor (to hold the dink away from the concrete quay) and the tension on the painter correct. We ambled up to the village, bought ice cream and looked for a restaurant that the guide books said was very good. We did find one restaurant but there wasn't a sign or name anywhere so we continued to walk but after a complete (but very short) tour of the village, we concluded that the one we spotted must be Chez Yvonne as it was the only one. I entered and an elderly woman appeared and through my disastrous French, I booked us a reservation for 6pm. Another point of interest in the guide books are some Polynesian ruins nearby. 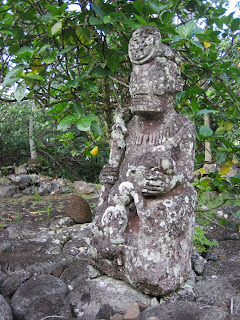 After asking a few people directions, a small boy walked us to the right road and we found several statues and 'paipais' or ceremonial platforms made of large stones. It is said that human sacrifices took place here. In search of still more archeological finds, we proceeded up the road and ran into a small group of people who appeared to be led by a guide. It turns out his name is Pierre, spoke pretty good English and said to meet him later at Chez Yvonne if we wanted to see the local museum. The ruins we found this time were striking and awesome, with one ancient sculpture of a bucket of human heads. However, instead of lingering, the mosquitos encouraged a quick tour and we headed back to the village. Pierre was at the Chez Yvonne and after finding the key to the museum, gave us a personal tour of the small building and it's artifacts. He explained the art of Polynesian tatoos, who gets them and why. There was a drawing of the ruins we had just seen with an interpretation. Grateful for his time, we invited him to be our guest at dinner. He showed up with his wife, Marie Noelle, who is a historian. Since she had studied in Chicago, her English was very good and it was delightful to be able to ask questions of a French national about French Polynesia: "Do the Polynesians resent being a French colony?" Answer: What's to resent? The French government provides infrastructure in the way of roads, schools, health care, communications, etc. Question: We see every home, regardless of how humble, with a relatively late model car or truck - what do these people do to afford them? Answer: They can't afford them. They have a poor concept of credit. Question: How do Polynesians feel about French nuclear testing into the mid-90's at the Bikini Atoll? Answer: They were poorly informed by the French government but the cancer rates have not exceeded those of anywhere else. We talked for hours about a broad range of subjects. We thoroughly enjoyed their company. The dinner was very good (I had Pork in Rum Sauce, Ruthie and Corie had Shrimp Curry and Pierre and Marie Noelle had poisson crue, a local dish made of raw fish). All five us us walked in the dark to the quay where the tide had receded significantly. I had to climb down some rocks, jump into the dink while hoping to avoid getting drenched by a passing swell. We bade a hasty 'au revoir' to Pierre and Marie Noelle and returned to Rutea.